Here you will find the new mixers and showers of the premium brand hansgrohe. We have developed them with our passion for water and German engineering flair. 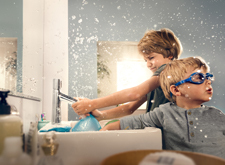 Check out Select, the innovative hansgrohe technology with a simple button. A joy to use at the touch of a button: in the shower, at the wash basin, or the sink. 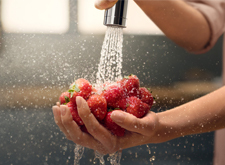 hansgrohe's new masters of the kitchen are attractive, versatile helpers - they come equipped with hand sprays, various jet types or swivel functions. 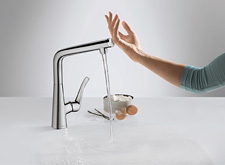 Top News for kitchens: convenient water control at the touch of a button. The "Select" button makes working at the sink even easier. It’s easy to switch to the feelgood factor. hansgrohe has now equipped its classic shower Croma with smart Select technology. 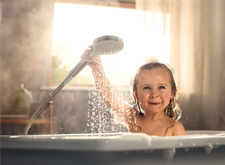 This means the whole family can enjoy versatile showers. Simply at the touch of a button. And the new shower head designs? Everyone will have fun with those! The Select button is purely mechanical, so no additional electricity consumption. Both are robust and have been thoroughly put to their paces in stress tests. So you will be able to enjoy them for many years to come.